Indiagames has spoken on developing first mobile Spider-man title with a team of four in under a month. The Mumbai-based studio told Gadgets360 that after finding moderate success with its own titles, a chance encounter at E3 2003 landed them a deal with Marvel and Activision to develop the first mobile Spider-man game. As a part of the deal, Indiagames agreed on an upfront minimum guarantee payment that almost left the company penniless. Funds weren’t the only thing in short supply for Indiagames, however. Due to licensing arrangements, the four-man team had very little time to develop the game. ”There was a very specific, non-negotiable request - the game had to be done in one month,“ explained Hrishi Oberoi. ”We had a blackout period where we could only do the sales of the game for about a six or eight-month period. After that, the Spider-Man 2 movie was going to be launched. That led to the team developing a 2D side-scrolling engine from scratch in 20 days, frequently using existing assets from Gameboy Spiderman titles while learning to produce their own animated sprites. 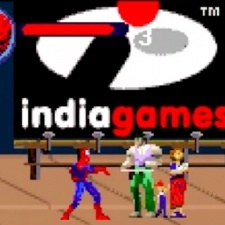 While Indiagames was able to get the game out the door, that was the first and only time it got its hands on the Spiderman IP. A sequel would go to mobile developer Mforma before Gameloft took over the series. Indiagames, however, went on to develop licensed games across dozens of IPs. While all four team members have moved on, they look back at the period as a demonstration of India’s development scene to be more than just a source of cheap labour.